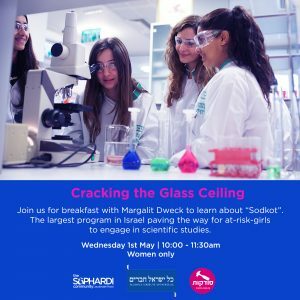 Join us for breakfast with Margalit Dweck to learn about "Sodkot". The largest program in Israel paving the way for at-risk-girls to engage in scientific studies. Women only. Join Margalit Dweck and help us make cakes, cupcakes and cookies for S&P Bake Sale for Shabuot. MUST RSVP. Rabbi Joseph and Margalit Dweck open their home to the Kahal, to learn Torah and enjoy sweets on the first day of Shabuot.